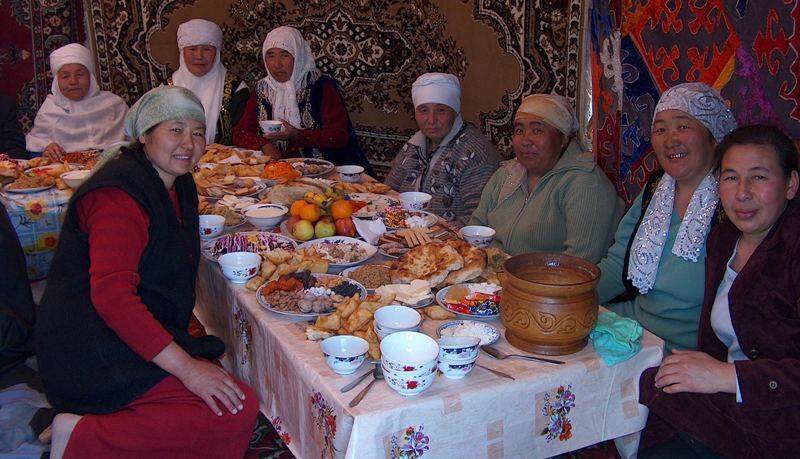 Dishes of the Kazakh kitchen. Dastarkhan is a low dining table no higher than 30 to 35 cm. It is comfortable to sit on soft korpes (mats) or a felting stretched in a garden half a meter above the earth between trees as a hammock with a few cushions tucked under your back. A more than relaxing environment. Be sure that you will not want to leave such a table for long time! Dastarkhan is often a whicker or sometimes collapsible. During the entire meal, dastarkhan should have tea, fresh fruits, raisins, dried apricots and sherbet. You do not need any fork or spoon – it is customary here to eat with your hand and, abstracting from the prejudices of the European civilization, you cannot help acknowledging that eating with your hands is pretty convenient. Food is served in china and faience flat and deep plates and tea in round teacups and teapot. 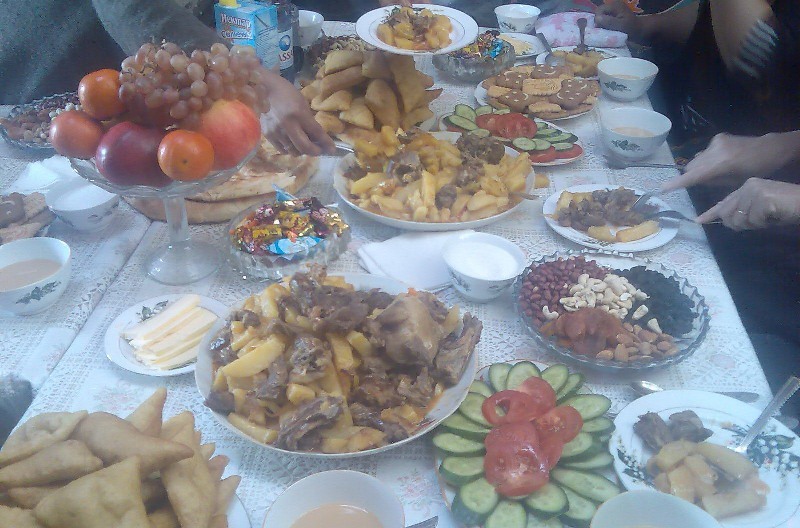 Tea and sweets are followed with vegetables and, at last, hot food such as manty, lagman, shashlyk or palau. There are some seasonal dishes. Early pot-herb and vegetable salads are made in spring, while a cold soup from sour milk or airan and pot-herbs is served in summer. Meat Dishes of Dastarkhan. 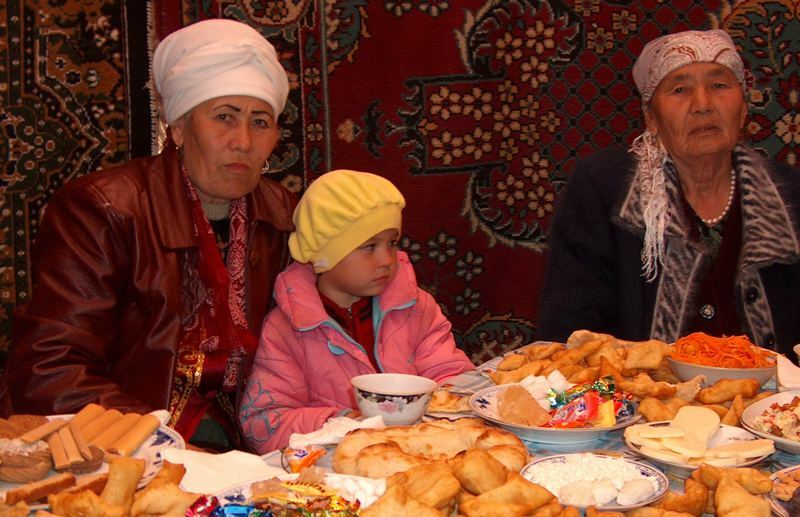 However, the Kazakh dastarkhan, like many years ago, cannot be imagined without meat. 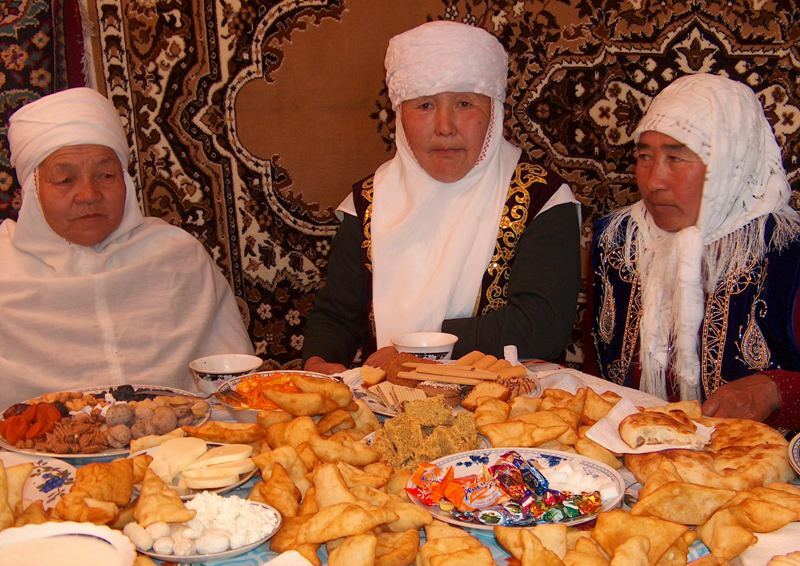 Delicatessen snack food is made from horse meat for dastarkhan such as kazy (horse meat sausage) or karta. Another dastarkhan dish is besbarmak. Boiled meat is served with thinly rolled out and boiled dough pieces and sorpa – meat broth – filled to sorpa cups. If you are not a big meat eater, you can taste sweet dastarkhan pilau (lamb, rice, carrot, onion, garlic and spices) cooked with dried apricots, raisins, prunes or apples. 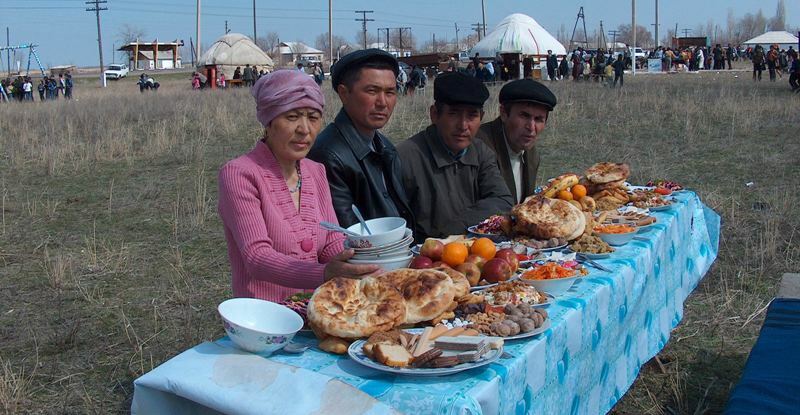 It is customary in the European culture to call dastarkhan not only the table itself but also the whole Central Asian meal ritual.